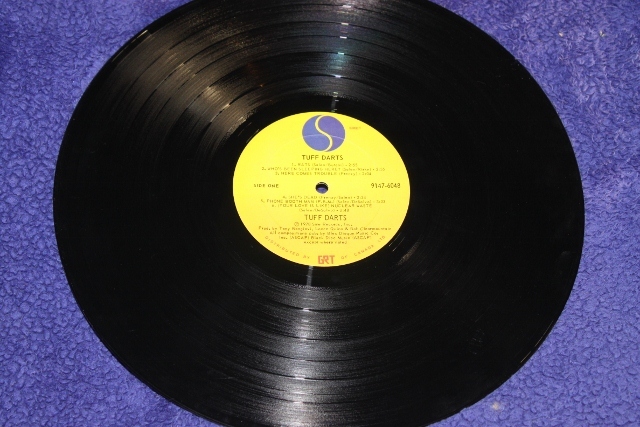 Maritime Vinyl: Crash course on the Tuff Darts! I own a few great rockabilly records by Robert Gordon in my collection and have been on the lookout for more of his albums. Recently, I found out that he was the former lead singer of a punk rock band from the 1970’s called the Tuff Darts. So, I picked up a copy of their 1978 debut album Tuff Darts! released on Sire Records in 1978 and it turned out that Robert Gordon never even played on this album, but I was not disappointed. The Tuff Darts were part of the first batch of punk rock bands formed in New York City in the 70’s. 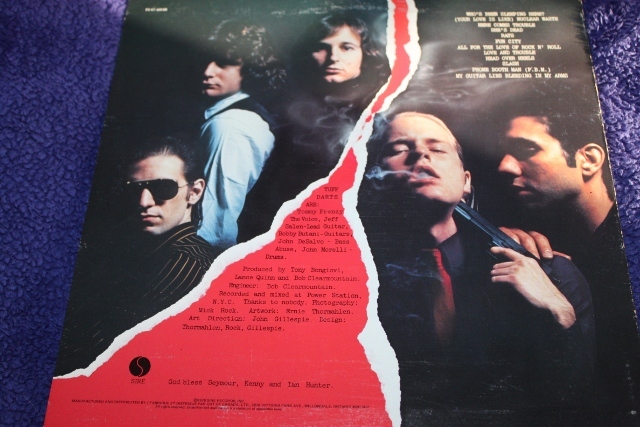 They opened for some very notable bands including the New York Doll’s and became one of the staples at some New York City bars including CBGB’s. Robert Gordon was an original member of the band along with Jeff Salen on lead guitar, Bobby Butani on guitar, John DeSalvo on bass and James Morrison on drums. 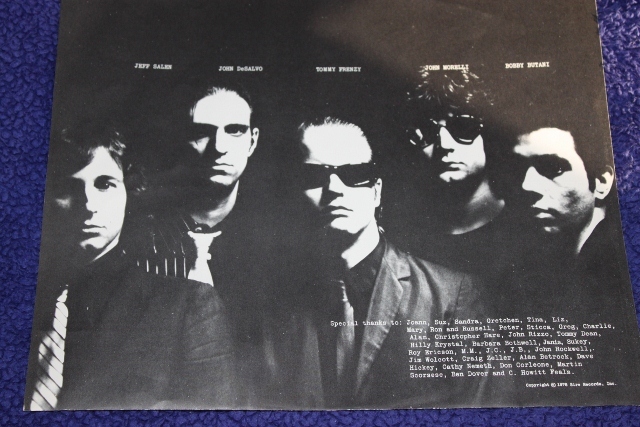 This line-up performed on the compilation album Live at CBGB’s. 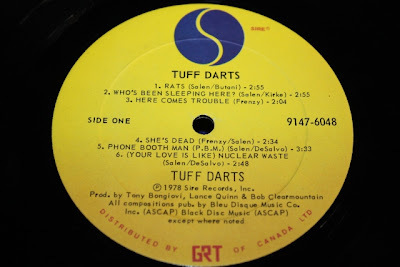 Between recording this compilation album and their debut album Tuff Darts!, Robert Gordon decided to leave the band to pursue a solo rockabilly career. Gordon was replaced by Tommy Frenzy on vocals and drummer John Morelli replaced James Morrison. 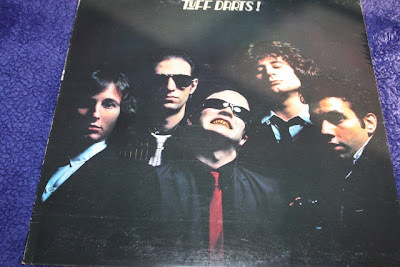 This was the line-up for the album I have, but it too was short lived as they disbanded shortly after it was released. I would consider the Tuff Darts’ sound similar to a band like Television. They were not heavy sounding punk rock like the Ramones, but the group photo on the album cover, the back cover photo of Butani with a gun pointed at DeSalvo with smoke coming out of his mouth, or having “thanks to nobody” on their liner notes, few could question them being classified as punk rockers. If this isn’t enough, their lyrics seal the deal. Lyrics like the following from the song Fun City: “I’m sick of the crap I gotta take in this town; If I didn’t love it I swear I’d burn it to the ground”; have punk written all over them. While the band may have been short-lived, some members continued to perform and re-record songs off of this album. Jeff Salen recorded an album with Robert Gordon in 1994 called All For the Love of Rock ‘N’ Roll, playing guitar on five songs and writing four including Slash and Love and Trouble which were from the Tuff Darts LP. Jeff Salen went on to record a few solo albums in 2005 and 2007, also revisiting a few songs from this album: Head over Heels, All For the Love Of Rock N’ Roll and Love and Trouble. All members from the line-up on this album except Butani reformed in 2002 to celebrate the CD release of Tuff Darts!. They went on a short tour after and recorded a new album called You Can’t Keep a Good Band Down in 2007. Unfortunately, the following year Jeff Salen died of a heart attack. Its finding albums like this by mistake that keeps the adventure in record collecting. I love discovering somebody I like such as Robert Gordon and tracing back his history. Even though in this case I never found a Gordon album, I did find something interesting. Now I just need to find myself a copy of Live at CBGB’s!